1. Remember my post about penguins in sweaters? Well, here are some rescued koalas in need of mittens. 2. You’ve probably seen Kid President give a pep talk, but in this video Kid President gets a pep talk and overcomes one of his biggest fears… talking to on the phone to girls. If he can overcome his fears, so can you! 3. Boys react adorably when they are asked to slap a random girl. 4. Look at these adorable doggy adoption transformations. Amazing what just one day can do! 5. As you’ve probably heard, Stuart Scott passed away Sunday after a long battle with cancer. If you haven’t seen his inspirational ESPYS speech, it is definitely worth watching. Categories: Uncategorized | Tags: Adoption, Articles, Australia, Dogs, Fear, Friday Finds, Inspiration, Kid President, Koalas, Life, Lifestyle, Motivation, News, Penguins, Stuart Scott | Permalink. What’s cuter than a penguin in a sweater? If I were to pick a spirit animal for myself, I would probably pick a penguin. Ideally, I would like to be something majestic and graceful like a wolf or tiger, but realistically I waddle more like a penguin. As you can see, these animals really encompass a “fall down seven times, get up eight” mentality. They are very resilient. But sometimes these little critters need a little help and that is where the Penguin Foundation comes into play. The Penguin Foundation on Phillip Island in Victoria (Australia) works to protect and preserve Little Penguins. The Little Penguin or Fairy Penguin, as they are sometimes called, is the smallest species of penguins. One way the foundation helps the penguins is after man-made disasters such as oil spills. The foundation rescues penguins by providing them with a sweater. 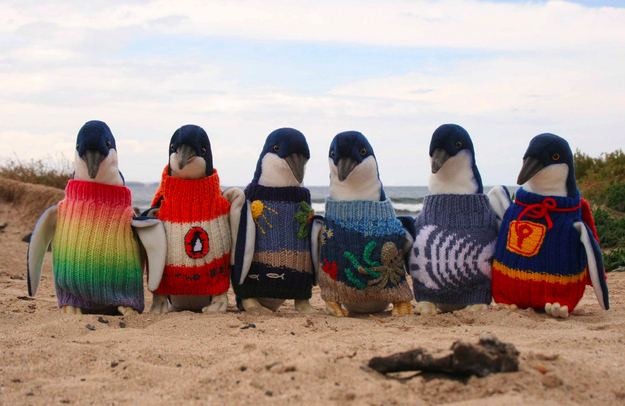 Yes, that’s right; they put sweaters on the penguins. Not only do the sweaters look adorable, they actually serve a purpose. What happens is the penguins’ feathers get matted from the oil, which makes it hard for them to stay warm. And what is the most obvious thing to do when you get cold? Put on a sweater! Not only do the sweaters keep these little cuties warm, it also keeps them from swallowing oil in their attempts to clean their feathers. After the penguins are cleaned, they are released back into the wild (sans adorable sweater) and go back to doing whatever it is penguins do. So now that you’ve read about the most adorable use for a sweater, I am sure you’re wondering how can I be a part of this? Well, it’s easy. One way to help is to knit a penguin sweater. You can go to this website to download a pattern and then get creative! This website also provides the address to send your finished sweaters. You have to send it all the way to Australia, so expect a decent shipping cost. Can’t knit? No problem! You can also donate to the Penguin Foundation or adopt a penguin of your own. You can even name your little fella! 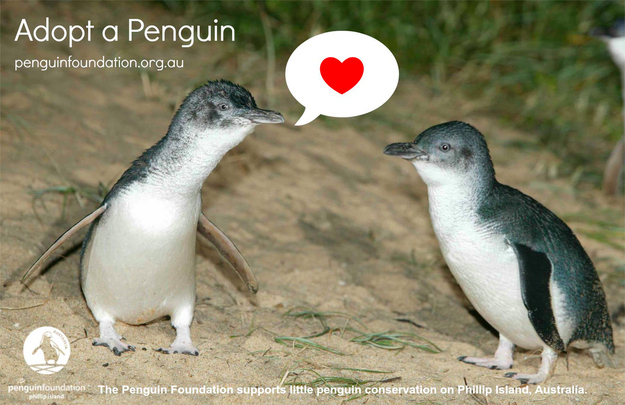 To learn more about the Little Penguin and this cause, check out the Penguin Foundation Homepage. Categories: Uncategorized | Tags: Animals, Australia, Cute, Penguins | Permalink.